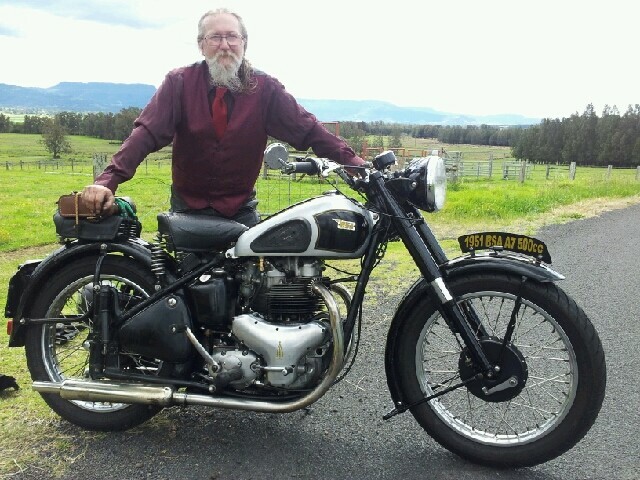 God I luv my BSA's. Been working on an 81 CB900F every night for a fortnight. Everything I look bat is either worn out, broken or bodged (some people should not have access to tools). Started as a quick start up and tune. Cleaned carbs, new coils & leads, spare pipes off 1100, starter solenoid, adjust shims and got her fired. Horrible top end noise turned out broken top cam chain tensioner. Cams out to change it and measured the chain. Bugga std is 175mm wear limit is 177mm this one is 185mm . So I dare say the main chain will be the same. Motor will have to come out and split so now looking at $1K at least on top of the $1K i've already spent. Should I keep going or just park it, the A7 needs a rebuild? I know what will be the answer! LJ I think he took his mate shaun the sheep to see the butcher, not the vicar!!! He had a goat which will shortly be curried. Maybe tomorrow I'll get the test ride in. Took bike for a blast to Wales. On way back had a pushrod jump out of the rocker cup, Chipping it! Noisy engine and a severe loss of power. Shame as i had been having fun up until then. Managed to lift rocker box, which had been severely glued down to reduce oil loss, reset pushrods, clean plug and off we go. Obviously it was alot more stressful than that short sentence. Think i was giving it a bit too much tap when it had got cold and the tappets must have been loose although i didn't adjust them and they got me home all be it at a less frantic pace. Happy days. Will have to decide if i am going to lift the top off again to see if i can find the bits of rocker cup before the DGR. Will be picking all your brains for replacement rocker parts soon. *warn*I would need to know where the bit or bits are, if you get stuck I've got maybe 3 or 4 chinky curry tubs full of rocker shafts washers spindles etc soaking in oil resting, I like that word , resting. Berger... would they be Goat curry tubs? After refitting the newly skimmed front wheel I went on a club run. Front brake now working perfectly with no judder. Met at Biggles Bar at Lydd Airport for breakfast and then set off on a 60 mile run around the Kent countryside and the bike performed faultlessly. Then with about 10 miles to go the back end tried to overtake me - a flat on the back - bugger! So I ended up with a DNF (Did Not Finish for those who are not trials fans). After a ride back home with the bike in the back of a mates van I found the offending nail which had probably been there for ages and had just found its way into the tube. I have an Avon Speedmaster on the back and a ribbed Speedmaster on the front which I have never really been keen on so I think I will change the tyres while the back wheel is out. I had a look at some previous posts on tyres and it seems that the Avon AM26 is quite popular so I will probably go for 90/90 on the front and 100/90 on the rear with some thick MX tubes. I have Akront flanged WM2 rims front and rear if that makes any different to the tyre fit. I think I will also carry one of the pressurised inflators with the sealant inside just to get me home if it happens in the future - any recommendations? Dropped in on the Norton Owners Reivers Rally. They were clearly having fun! Well. Long day in the garage today. Removed rocker cover and cylinder head to wash through and try to find the bits of rocker cup that chipped off on thurs. All back together now ready for a test ride tom. Never did find much, a few tiny crumbs, flushed through around cam followers with clean oil and numerous turnover kicks, couldn't face lifting the barrels! Anyone got any idea why pushrods should jump out of rockers? Assume tappet clearance too large and engine revving too hard when cold? Replaced battery. It seems the Duracell 6V gel cells I get have about 18-24 month life expectancy. So about $1.50 - $2.00 per month for battery. Progress on latest project.... Cylinder head painted, new guides installed, seats reground ( 1 x exhaust took over an hour! ), valves fitted. Going on a run tomorrow so may not make any progress until next week. Got a family holiday starting soon so project will get sided for a couple of weeks. Fitted the cylinder head today. Pulled the plungers old regulator apart & installed a DVR2 into the old cover.. I've decided to take number-two son for a ride on my bike to encourage him to complete his bike test. I've dragged out my old dual seat and cleaned up and painted the fixing brackets. My wife made a cover for the seat, about a million years ago. As it's not been used much since then it's still reasonably good. I don't have any pillion footrests so I rode to my fairly local BSA shop, (C&D Autos) and bought a new pair for <£20, which I reckon is very good value. Now, the problems: The frame holes are mahusive so that sidecars can be fitted, either side, (or both at once if you like!). The BSA parts list shows item 67-4183, Pillion Footrest Adapter, (solo). I've tried making something up out of scrap bits-n-bobs but that was not very satisfactory. I've just made a drawing of what I want and asked CPC Engineering if they are able to make a couple of the adapters. I'll let you know what happens.